‘Mindful loving’ is a 2 day experiential workshop on increasing the body and mind awareness on the way we experience and manifest love for self and others. The program modules are designed with elements of exploratory experience for LGBTIQ persons. The intention of this psychotherapy based awareness program is to enhance the way we access the mindful and authentic self in the here and now, during our daily interactions and expressions. 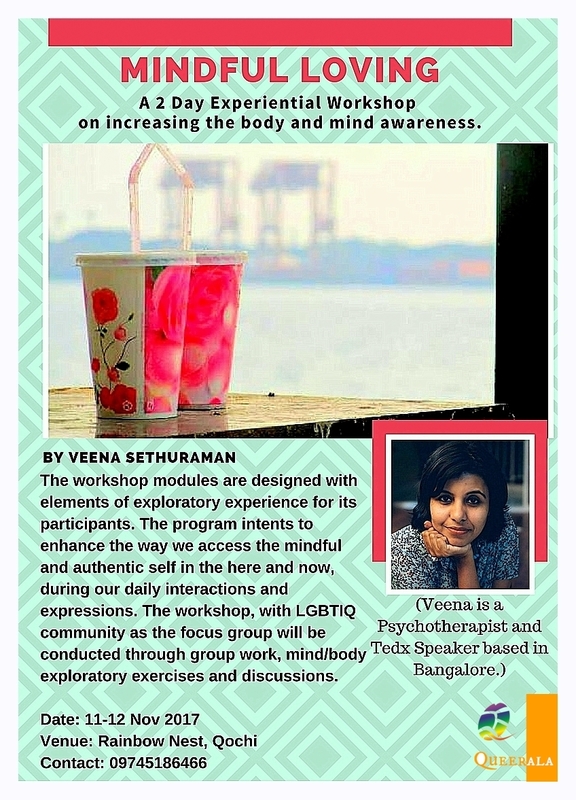 The workshop will be conducted through group work, mind/body exploratory exercises and discussions at Rainbow Nest, Qochi on 11-12 Nov. If you wish to attend the workshop, please fill the form given below or contact us at queerala2014@gmail.com on or before 08Nov. Our team shall get in touch with you if your profile is shortlisted for the workshop. Note that the entry is limited to only 15 participants. Mindful Loving, Two Day Experiential Workshop.